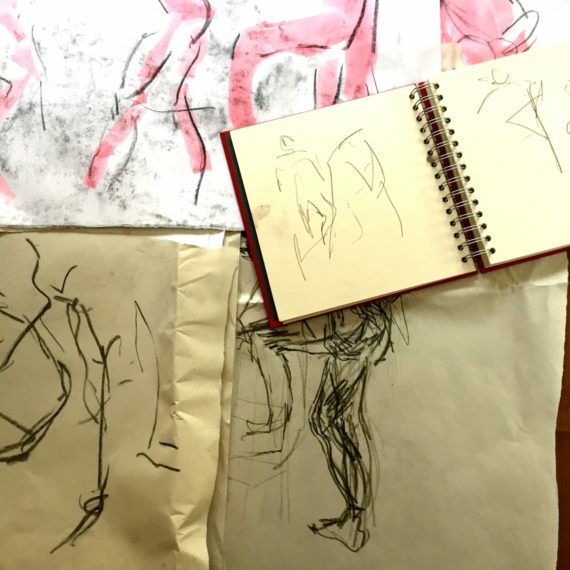 Yesterday I attended the first of five day classes in Drawing and Movement at The Royal School of Drawing in London. 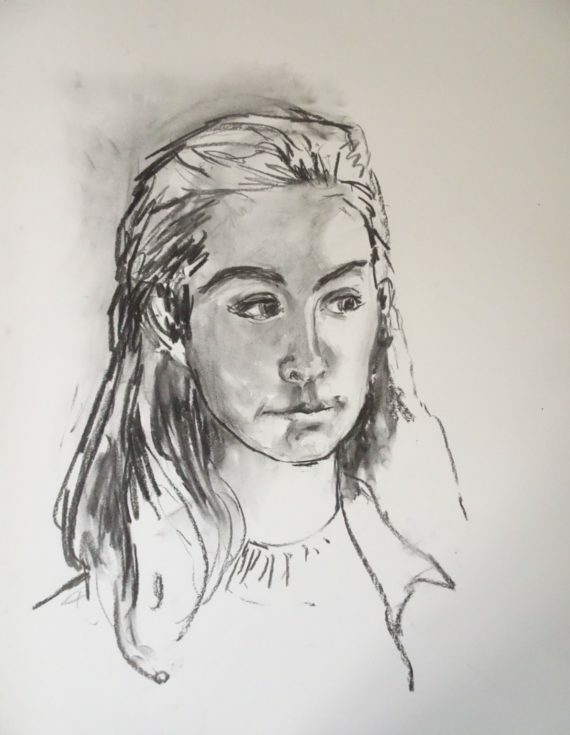 It was a very full-on practical session where I learnt so much about drawing from the tutor, Sara Lee-Roberts. 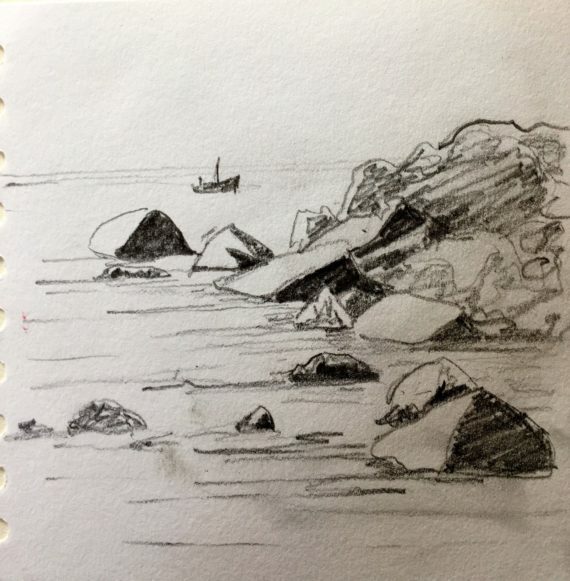 I’ve been drawing all my life yet there is always something new to learn…a way of looking, a way of expressing, a variation on a well-worn technique, a letting-go of elements of your comfort-zone. It was inspirational and most of all practical and active. Here is a small sample of the dozens of drawings I made. So different from the previous days activity where I sat in college with my peers for a group crit for 4 solid hours. We listened and discussed the work of 5 of the MA group – it’s my turn next week with the second half of the group. A trite expression…. but it blew my mind. The contortions my brain went through trying to understand the complex theories they proposed in relation to their individual practice were exhausting. So I’ve had a pretty demanding time both physically ( leaving Colchester for London at 7.30 a.m. and getting home at 9 p.m.)on Friday and mentally on Thursday. Today (Saturday)I woke early with a lot of thoughts swirling around which I just had to get down before they disappeared. What is ART? Is it skill-based or all in the mind? Until I started my university journey I more or less believed it was skill-based. 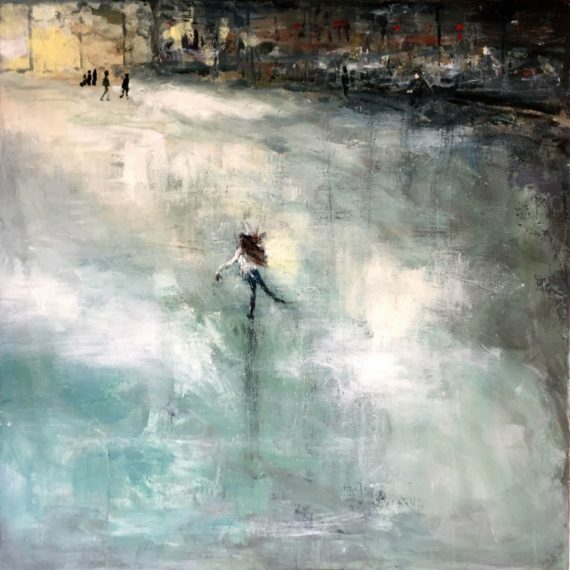 Having been born with a natural ability to draw which over the years I have sought to improve upon, and having always loved looking at art in galleries and learning from this it has become the central part of my being. Alongside this practical skill-based aspect, I have of course, informed myself with the History of Art. Essential to fully understand the subject and have been greatly influenced in my practice by what I have learnt….context (in the mind). I think I’ve always been aware of context but have never given it a name until now. A great simplification, I’m aware, but art pre-14th Century actually changed very slowly and was almost entirely skill-based. There were no schools or movements as such. We have given them names retrospectively. Artists simply competed to outdo each other in artistic skills.Painting and sculpture were mainly commissioned by the rich either to adorn churches and sometimes public buildings or to represent themselves in portraits. It was not a global, technological world as it is today so that styles and innovations grew slowly in isolation in different parts of the world. I suppose I have to admit that I am mainly thinking about Western European painting practice here. It was not really until the invention of the camera when the ability to represent instantly and in stark reality became possible that art took a dramatic change in direction and purpose. To me this is worrying. The search for originality leads to ever more stretching of the boundaries of traditional skill-based practices. Progress is vital of course and innovation of thought and of new technological advances cannot and must not be stopped. These things lead to increasingly beautiful and amazing artwork but I just feel that art should always be underpinned by fine art skills. At it’s best this is still true. Many of today’s artists are superb draughtsmen and although not evident in their final works, these basic skills are at the heart of much ground-breaking artwork. But there are also many other so-called artists who do not possess these attributes and their work is the poorer for this and it remains to be seen if much of it will endure. I am of the opinion that we should redefine art into new categories of Fine Art and Creativity. The term Creativity could define a vast array of things which are happening in art today but which are not, in my opinion, actually Art with a capital ‘A’ however incredible or beautiful the results. Inevitably there would be crossovers but these would retain the value of skill-based art which is being eroded to some degree. The great leveller of time will prove what does or does not survive as Art. In the meantime I must struggle to come to terms with the jungle of art styles, schools and movements for the sake of gaining my MA. Researching artists recommended by my tutor I was interested to read about Castellas. One critic described his work as ‘abstract with figurative allusions or the other way around’. The constant debate to align with a genre or style of painting is something I have found difficult to embrace. 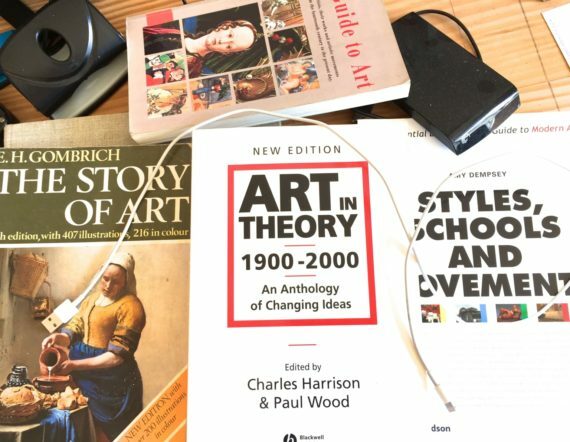 Having been steeped in figurative ideology for most of my artistic life, my BA and now my MA courses are moving me towards more abstract approaches. 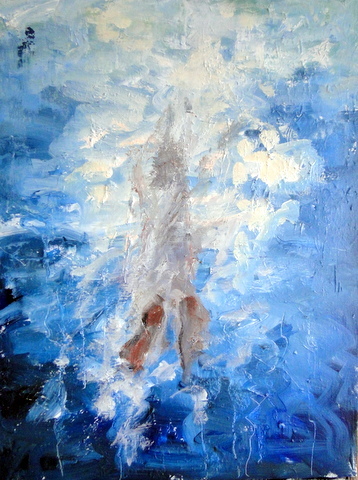 Abandoning the figurative is part of my journey to find my own voice. But it’s not the answer. How many times have I been told to ‘do my own thing’ yet still I persist in trying to conform, please, second-guess my tutors. My latest series of work is yet another attempt to discover my own visual language. Kate has become my muse, lately and I’m trying to capture the essence of her and not just her physiological likeness. 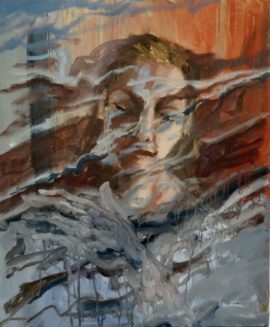 I still felt I should start with a good figurative likeness and move out from there into more expressive/abstract waters. I really wanted to paint at this stage but she can’t sit still long enough! So regrettably I resorted to a charcoal drawing and working from photos which I feel is far too sterile. To reconcile this method, a proper observational drawing seemed to placate my dislike of photo references. This is it. Although I’ve drawn her before many times, of course. 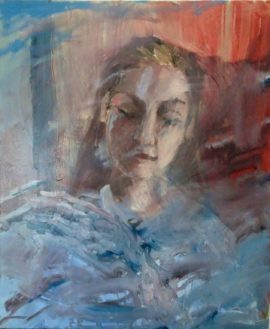 Having looked at Castellas, Elizabeth Paton and Krebber at the behest of my tutor I was drawn towards oil-paint for a this project and began a portrait of Kate. 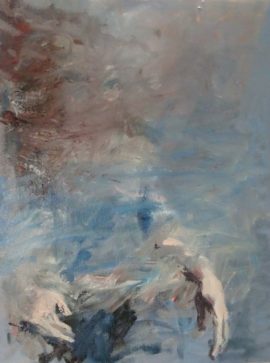 It didn’t work and in desperation I began to cover the surface of the loosely figurative painting, mixing the colours I was using into a blue/grey sludge.Then something began to happen. I realised that her hands were, in fact, her essence. 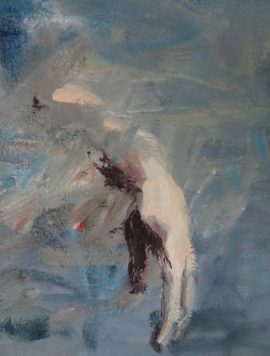 When she dances (ballet) she moves her hands so expressively and as she sat reluctantly for her charcoal portrait, her hands fell into beautiful lyrical positions which I then emphasised through the grey sludge and it suddenly became Kate. A second portrait where I tried again to represent her fairly realistically also failed. Photographs can do this so much more easily unless one is prepared to spend hours on a painting. I probably could do that but it’s not in my nature. I’m so impatient and find it hard to put in the time required. And besides, it’s no longer what I’m trying to achieve in a painting. This time I had got further with the image so was reluctant to completely obliterate my efforts. So I painted watery lines across her, thinking it would take on the appearance of water or maybe a veil of fabric. Now it began to look rather gimmicky. So as I was using oil-paint I was able to wipe this layer off, strategically leaving some areas more distinct than others. This seemed to be working and with the addition of a ghostly hand image it felt almost finished. Still not sure this is it, but will wait and see how it looks tomorrow. But what I have learnt through these experiments is that the process or style has to be tempered to express and say what you want the viewer to see in the image. It isn’t about abstraction or figuration but the totality of the image and what it can convey. 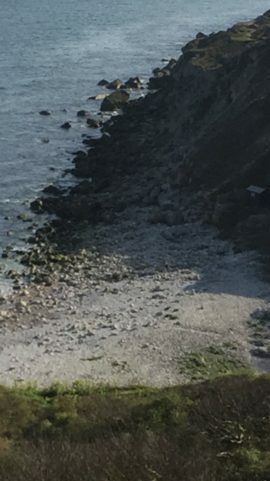 Had a great time in this beautiful place. Reliving childhood memories with adult eyes and seeking inspiration for the final push on my MA. After painting Kate in the wide open space of the Pompidou Centre I was again struck by the dwarfing of us humans in spaces. 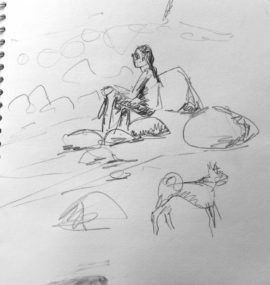 Here are a couple of quick sketches I made of the girl with her dog. I also made a watercolour drawing of her silhouetted against the sky when she later climbed to the top of the cliff. Her lovely thick auburn plait and pale aqua wellingtons flashing in the sunlight – a serendipity addition of unusual colour and detail to be included somehow. And here’s the painting. Much more figurative than I have been doing lately but decided to go with this for the moment. May try again being more abstract and thinking myself back into the moment. Hmm…. will have to see and more importantly to think about it. At least I think I’ve achieved the feeling of space and height above the beach but would like to go more abstract. 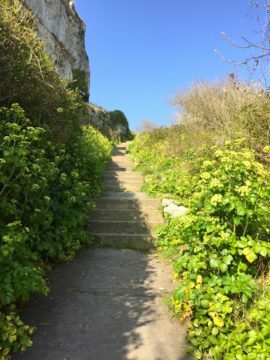 Sorry to blog again so soon, but I’ve just had another light-bulb moment so have to blog it before I forget it. I completed (I think?) 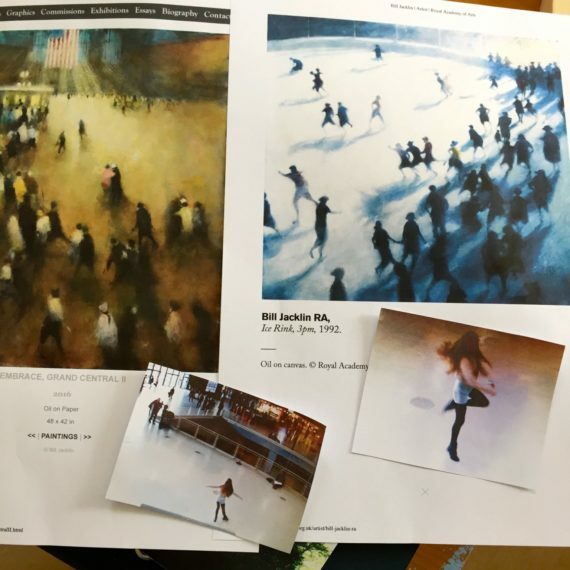 a painting this morning and after making a coffee, returned to the studio for a second look and was immediately struck by the memory of seeing Bill Jacklin’s work at a small exhibition at the RA. I swear I didn’t look at his work before making this painting! I rushed to look through an old sketchbook and there was an account and illustrations of his work. 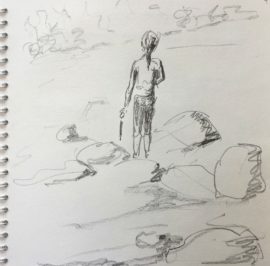 Further trawling through the internet revealed an interesting Vimeo interview with Jacklin about how his work is all about light, plus research contained within his copious sketchbooks – lovely little figurative drawings of people and places. These form the backbone of his subsequent paintings and prints. I couldn’t help thinking that really so many painters, including myself work in this same way. What an artist/painter then goes on to create is where the magic comes in. The same working practice results in a startling plethora of different outcomes. The brain is a wondrous thing. The memory of seeing Jacklin’s work, probably along with Degas, Giacometti and who knows who else, has obviously lodged in the back of my brain. 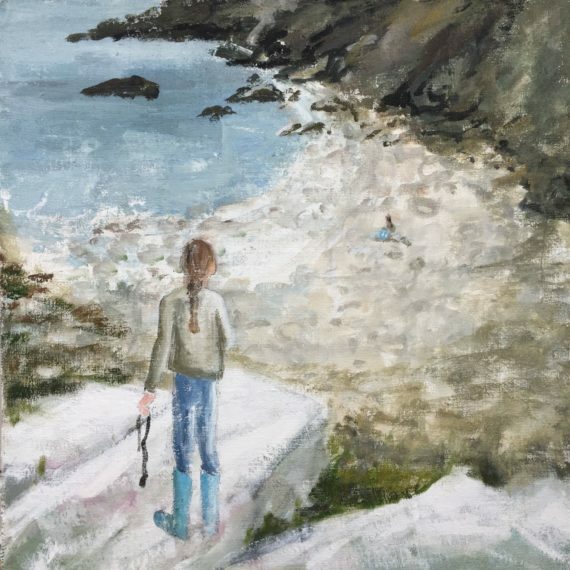 Along with my own drawings, my feelings & memories of Kate, the brief video (see previous blog-post), these recollections of artists work seen over the years, have all combined to make this latest painting. That’s what the process of painting is all about. Having to describe all this in my Reflective Journal sometimes drives me crazy!! It’s important to visit local galleries as well as the big London ones. North House Gallery in Manningtree, Essex is an absolute gem. As well as being a beautiful Georgian building housing the most luscious print room stuffed with tall drawers full of metal printing letters and several magnificent Victorian printing presses, it has an ancient brick floor and original windows looking out onto a gloriously unkempt courtyard garden. There are 3 rooms where the artwork is always tastefully displayed, plus a large browser which is full of Norman Ackroyd prints. 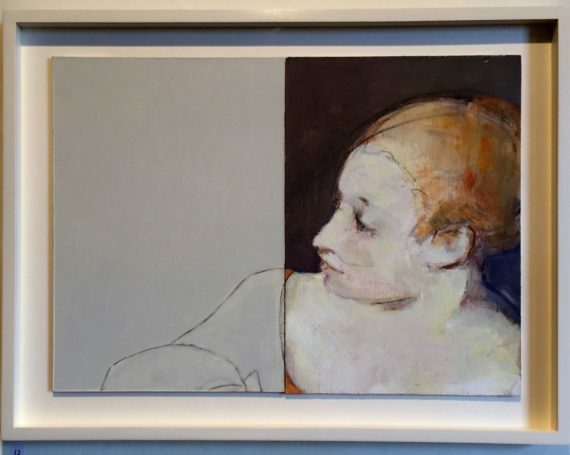 Today’s PV of Sara Lee Roberts paintings attracted me and my visit proved extremely worthwhile. 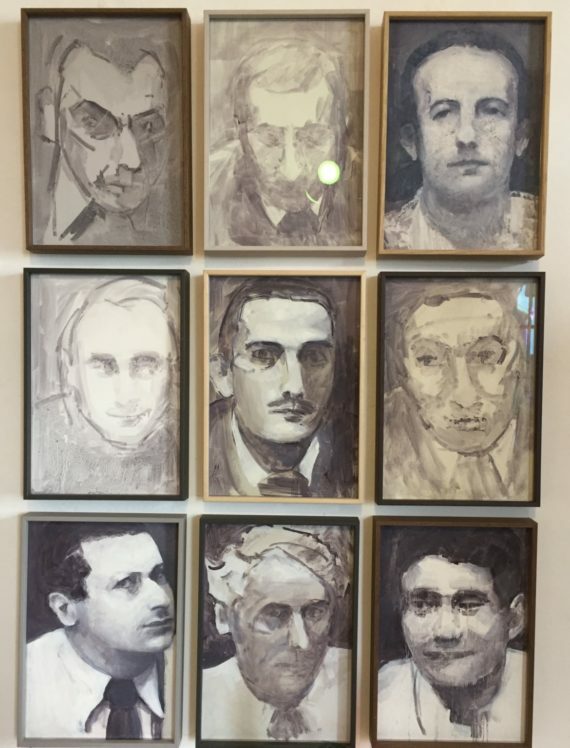 This series of portraits of Surrealist artists made me wonder if I couldn’t resurrect my portrait series of MA students? It’s a thought. I need to find my own visual method of capturing the essence of the subjects as Roberts has done here. The minimal detail and the unifying colour at this early stage seemed to say more about the characters than later when they were approaching completion. I might see if I can recapture this phase. It was interesting talking with Sara Lee Roberts about her work. We agreed that the moment when a painting is finished is so hard to judge. Much easier to spot looking at other people’s work than your own. 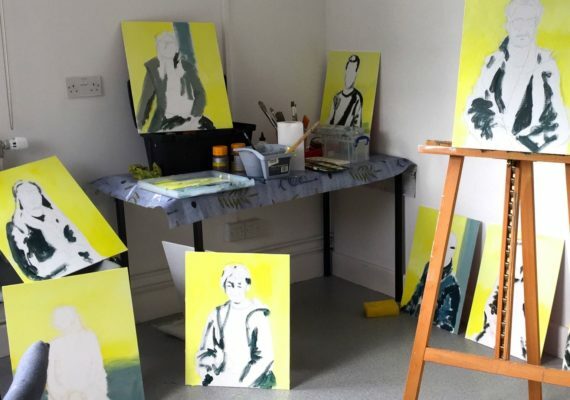 Her versions of sections of famous paintings were quite different from some of her acrylic red and black abstracts, yet she says they have a relationship with the portraits creating ‘new and distinctive hybrids’. This sensitive portrait is her version of a small section of a Watteau painting. I think the unfinished section on the left on a separate board adds to the mystery of the whole and balances the head. There was much to learn from observing the work and the variety of materials and techniques she employs.